Click to Check Out Our Video Testimonials! Shop from the comfort of your home for all your flooring needs. Over 8 million Sq. Ft. of flooring In-Stock! "Hi, Lee! Just thought I'd let you know that I finally got the carpet installed, and it is awesome! Thank you for your service and patience, especially when it came to answering my silly questions. This was my first time ordering carpet. You guys rock! Take care! :)"
"Here are some pictures after my installation. Working with Jeff Ellis at Georgia Carpet Industries was a pleasure. 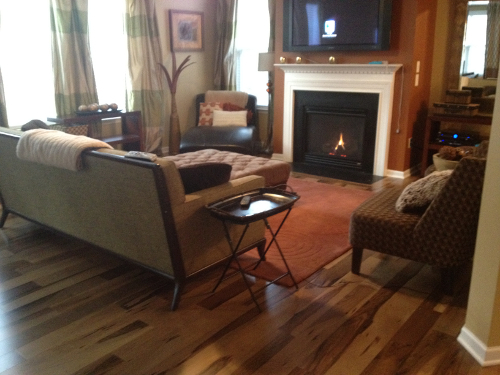 My wife and I described what we were looking for and... Jeff took us right to this beautiful Acacia hardwood. It was simple and fast and at a great price.Jeff can even recommend an installer! We love our new floor.Thank you Jeff!" "Linda! 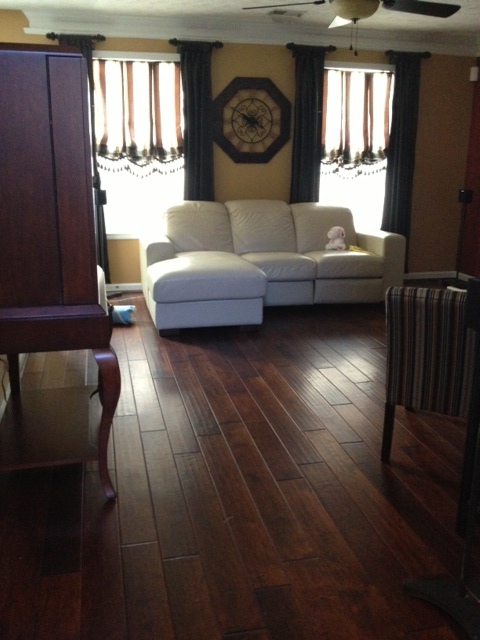 Thanks for my awesome shaw flooring." "Hi Kathy, Just a quick note to say.....I LOVE my rug! Love the color, love the size, love the softness, love the serging, love everything about it! I truly appreciate all your help. You're definitely my future rug source, and will spread the word to friends. Attached are a few pics for you to see the end result." "Dear Steve, I appriecate your attitude. You have been easy to work with by phone and in person." "Dear Kim, The Stanton carpets came in. Perfect, as always. Boy, that was fast! Thanks again!" "Hello Teresa, Thanks so much for your help. I really appreciate that you personally picked out matching carpet tiles for me. You went above and beyond. I have already recommended your company to several other people. Have a great day!" 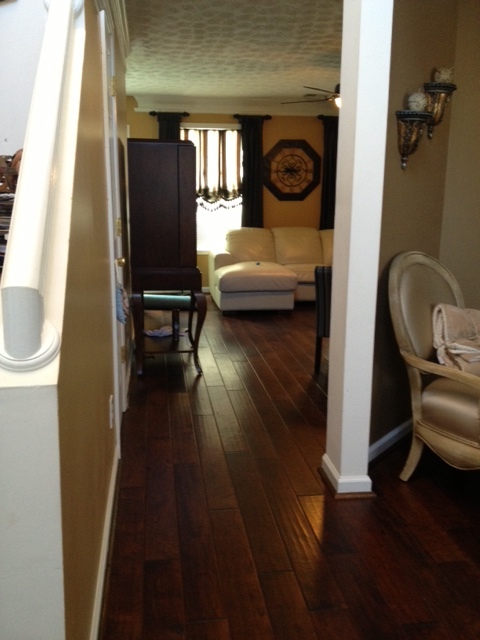 "Linda, Thank you so much for your help when purchasing my Indusparquet hardwood floors. They are absolutely beautiful and I am very pleased with the final product! You were very knowledgeable, quick to respond and your prices were also very competitive. I would happily work with you and Georgia Carpet Industries again! Thanks for making the process so easy and for a phenomenal product!" 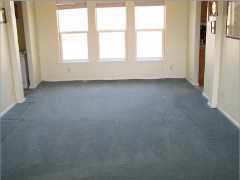 "Hello GCI, I wanted to say how pleased I am with my new carpets and how much I appreciated all the extra effort to make it so. Theresa was wonderful to deal with. I would highly recommend GCI to anyone who wants to purchase carpets or any flooring as GCI was a pleasure to do business with. If it isn't right - they will make it so and without any headaches to go with it. I can't say enough about their customer service. They deserve the Better Business Bureau's high recommendation for sure. I also wanted to say how well the installer you recommended (Doug McClure) did with the installation. It looks great!" John: Ben and I want to express our sincerest appreciation for all that you have done for us. 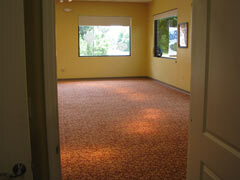 We LOVE our beautiful new carpet and enjoy the softness and squishiness. Our family loves to lay around on it and believe it is therapeutic for our feet and back. THANK YOU! We want to purchase some light lavender carpet with like quality for our daughters room. I will send along a similar color via email and you could show us some samples that you have come up with when we visit again. Xander said he can not wait to go carpet shopping again, so I know he will look forward to the next occasion. Let us know when our tile comes in and we will send the guy up to pick it up. Hi Kim! I received my shipment yesterday and everything looks great! Thanks again! I just wanted to thank you so very much for all your help in making my hardwood choice and purchasing process a flawless one. The floors are absolutely gorgeous. The complete wood order is exactly like the sample you sent me but 10 times better once all laid out :o) Simply beautiful! 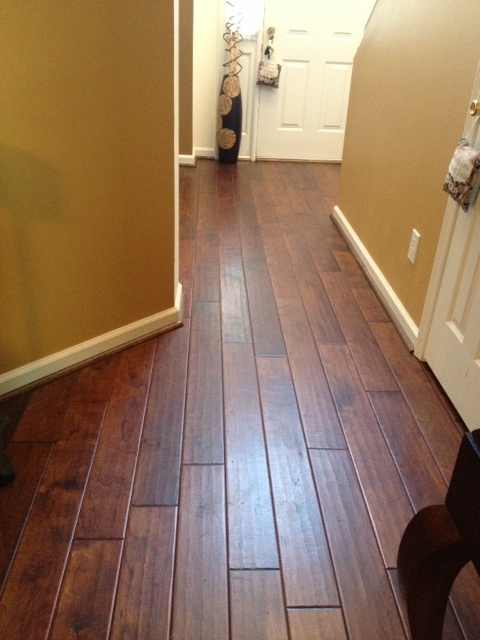 I would also like to thank you for recommending Chris Hough of Hough's flooring for my installation. It was a most pleasurable experience for me. I had no idea how smooth the process would go being that Chris showed up on my doorstep with 5 guys (including himself) but needless to say, it went extremely well. They all were very prompt, friendly, respectful, and professional, AND most important..."Perfectionist". They worked extremely well together. So much so that they installed 3 rooms plus a foyer all in about 9 hours!!! And the floors look Amazing!! 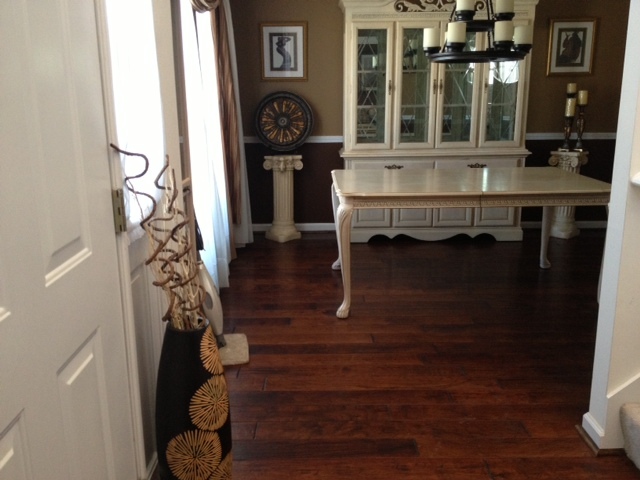 (I attached a photo of my foyer and will send a couple more. Thank you again! I will be enjoying my beautiful floors for years to come!!! I just wanted to let you know that carpeting is down and it is beautiful. You know how they say if it sounds to good to be true, it is too good to be true. Well I no longer believe it. The price and the quality of this all wool carpeting is too good to be true. 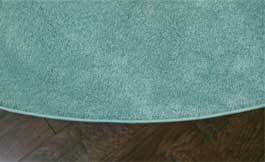 I was looking at wool carpeting at almost twice the price that was neither as attractive or as soft as this carpet. We love it. This is old fashioned customer service. It comes from caring about the customer. Obviously the cost of the carpet and padding was a small order and I am only one customer. I appreciate the way you treat your customers. It makes me a repeat customer in the future. Thanks to you and John for meeting my schedule. I will recommend you anytime. We received the rug from Stanton. It was perfect, as usual. Thanks for all your help. From: Josh M. Sent: Saturday, November 03, 2012 To: Claudette Hefner - Georgia Carpet Industries Subject: Thank you! Dear Claudette, Many thanks! We are enjoying our new carpet! Thanks for all the help over the summer months! We look forward to doing business again with you soon! You have been awesome to work with too. The first round of snow has melted already so now I can still get into the hayfield and pick rocks (so I don't hit them during haying season with my equipment). I will send you pictures of the snow, I promise. I will send you a picture of the livingroom with the ugly blue carpet and then one of it with your beautiful carpet. Thanks a million. You have been great. I will be showing the samples that I have to everyone I can. I have already told a bunch of people about you and your company. I hope they all buy from you soon. Gentlemen, I had the pleasure of working with your sales associate Kathy Boran last Thursday. I would say that she is the true example of your company's tag line "It's all about you". From my first inquiry call to my visit to your showroom and warehouse she exemplified the customer service motto on your doors from start to finish. I not only went away with some great ideas and samples but also purchased three rugs that were not on my list to purchase. Linda! We are so happy with our new carpet. We've been extremely pleased since it was installed. Thank you so much for the work you and your team did. Also, Doug did a great job installing! 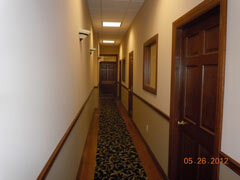 We had a customer who works with a local carpet firm come in and say it was the best install he had ever seen. Here are some pictures. We had enough carpet, used about 140 yards. Looks great. Thanks. Ms. Hefner, just wanted to thank you for having the carpet shipped so quickly. I haven't even seen it yet since others met the truck and unloaded it for me. Thankfully, my wife finally is back home from the hospital and, hopefully by Monday night we will be able to enjoy our new floors. I certainly appreciate the way you made this transaction as smooth as it was under very trying circumstances. Theresa, I just want to THANK YOU for all of your help in the exchange of carpet resulting from my receiving the wrong carpet initially. You were so calm and peaceful in handling my upset. The carpet arrived and my installer finished on Sat. It looks great. You and Claudette Heffner went the extra mile all the way. Again, THANK YOU!! 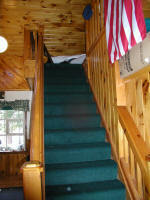 I need a light beige wool carpet for my stairs and a landing 38x42 which is a separate piece. 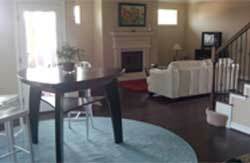 I would also like to order Bruce American Vintage Walnut Mesa Brown hardwood flooring. Install complete today on the wood it looks just beautiful. I greatly appreciate both the time and patience shown in dealing with me on my selection of carpet. Your suggestions and guidance are most valuable. Received flooring on time and in good condition. Thank you for your prompt service. In fact I gave the fed ex driver your company’s name so he might locate a particular style he was looking for. Thank you for the great customer support. I have attached the form. If you need anything else, please let me know. I have recommended your company to a couple of other business associates who own miniature golf courses and I personally own 6 rental houses. We will give you repeat business. Just wanted you to know the carpet arrived at the perfect time and was easy to unload. It was put in and the kids love it. It really changed the looks of their home. Thanks for the great service. You are most welcome and thank you for your courteous responses, as well as the thank you card. I did receive the carpet today. As it turned out I met the truck, at a Walmart parking lot, about 5 miles from my house, as the driver was concerned about maneuvering his 53" trailer on the roads around our Lake. I had talked to him, on the phone previously and suggested that I meet him there so it would be easier for him. That worked out fine. He was a nice guy and he helped me get the carpet on my pickup. So it all worked out fine. All I have to do now is finish the work on our sun-room so I can lay it down. I hope that you have wonderful holidays and all the best. It has been my pleasure to do business with you. Shipment arrived next day (Wednesday). 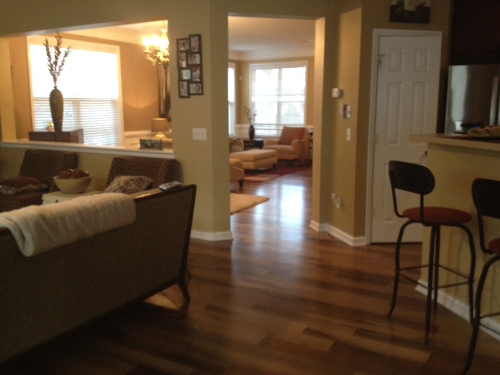 Floor turned out wonderful and it was a pleasure dealing with GC on this project. I just wanted to take a minute and Thank Kim for the wonderful customer service. I am from Minot ND and I was one of the 4,000 houses that got evacuated and I ended up with 5 1/2 feet of water on the main floor from the flood. I was referred to this site from a co-worker of mine. I requested a few samples and chose the carpet I wanted. 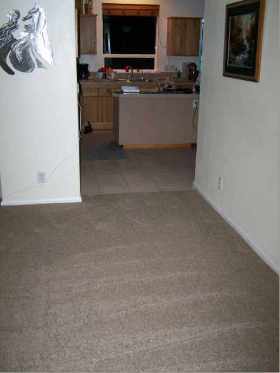 It was very easy to order the carpet and Kim was very helpul in helping me with ordering the carpet pad as well. When I recieved the carpet there was a large tear in it and later when the carpet installer unwrapped the carpet there were 2 more large tears. I called the company and within minutes someone from the claims department called and asked how much we needed and said that they would get it right out. The carpet installer called me to ask where we got this carpet because he had never installed such great quality carpet before. He also asked the price and could not believe the price! For what I paid for the carpet, carpet pad, shipping and the cost for someone to install it was still less than what I was quoted from one of our local retailers for just the carpet! Our local companys are raising their prices due to the flood and taking advantage of the customers. I was so releived when I got the carpet and it was just like the sample. I loved the price and quality of the carpet. It looks great in our house and our 3 kids rolled around and were so excited to have carpet in the house again. Thank you to all who made this an easy transaction! I will be back when we are able to finish our basement if it does not flood again!! I have been telling everyone I know that was flooded to call you guys for there flooring! Thanks again! We want to thank all of you who have helped during the order of the carpet, adjustment to the damage of part of the carpet. Thank you so much for the fast service in many ways. We love the carpet and have passed the samples down to one of our friends, Denise Armstrong, she also have friends interested in carpet. We will definetly refer to you for any future carpet or flooring needs of our own as well as others, thank you so much again. Our carpet was installed yesterday and we are very pleased with it. Like most people, I was a little afraid to buy carpet online. However, with all the samples that you provided we were able to find exactly what we wanted and felt good about ordering. Once we committed to buy, the whole process was very easy and fast. 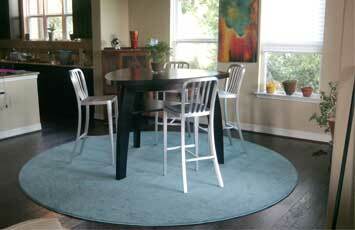 In fact, I think it was the best carpet buying experience that I have ever had! I will recommend your company to others with no hesitation. From: lion I. 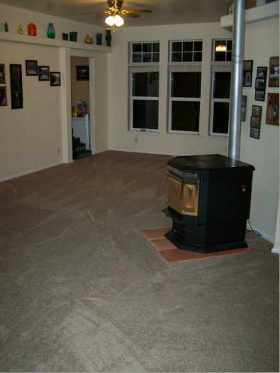 Sent: Saturday, November 05, 2011 To: Kathy Boran Subject: Carpet Here and Installed!!! 1 hour later; installed in 3 hours.....done. Pretty good I would say...from ordering from you last Monday - to delivery and installation on Friday! The carpet is beautiful; excellent. Could not be more pleased. My wife is ecstatic! Please know, I will not hesitate to re-order from you and do business with you again. And, I will definitely "spread the word" to friends and family regarding your service. You were excellent to work with - efficient, courteous, knowledgeable and quick to respond to emails/phone calls. Please share this email with the owner of Georgia Carpet - he/she needs to know! 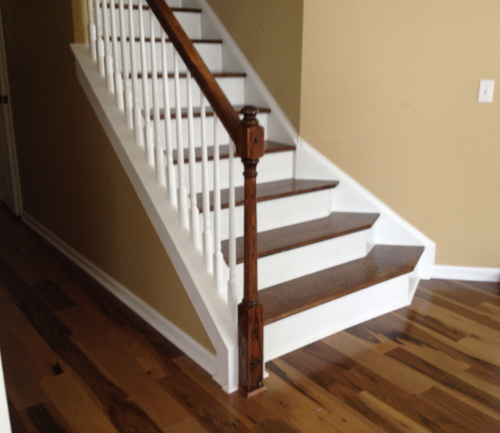 I just wanted to thank you so much for all your help with our hardwood floor purchase. My husband and I were concerned about ordering on-line but you helping us every step of the way made our fears go away. From finding the floor we wanted to answering our questions and delivering the floor on time and in good condition. The truck driver was even helpful in helping us unload the 18 boxes. He also waiting until we examined some boxes that had outside damage but the floor inside was OK. I thought I would attach some picture of how beautiful and easy it was to lay the floor in our living room and dinning room. 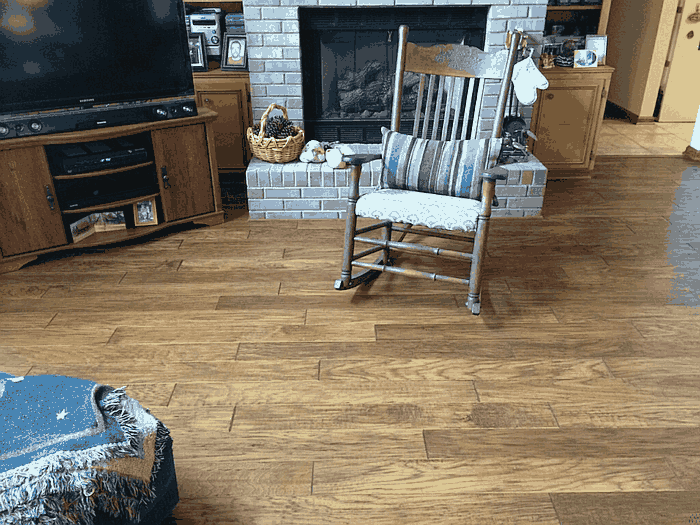 As you see in one of the pictures we have a dog and we were concerned about her scratching the floor but since this floor has in-perfections and is hand scraped it is hard to tell were she scratched it. I would recommend this type of floor to pet owners. We received our flooring today. I just wanted to let you know how pleased we were with the speed and simplicity of this transaction. Our previous experience with another company did not go quite as smoothly. We will be referring people to your company. To: Georgia Carpet Industries Subject: Lynn Parsons I purchased carpet for our home with the assistance of Ms. Lynn Parsons. Being age 77, it was a challenge. Ms. Parsons made it a pleasant and good financial decision. Her knowledge, understanding, and advice was perfect. We now have the carpet in the house. We likely saved about $1500 by baying it directly from you. Looks great – perfect! I put in the transitions from wood to carpet, they look great with it. Doug was awesome, appreciate the recommendation. I’m telling everybody about you guys and your customer service! Unfortunately too many people neglect to get back and express their appreciation for good service. I do not want to be one of them. Our order arrived in about 6 days. The local warehouse delivered it within the two hour window specified when I made the arrangement for it to be brought to the house. The carpet and pad was exactly as specified. It was installed over the 4th of July weekend and looks great. Your attitude, responsiveness and proactive action to reserve the "quiet neutral" for us made this a great overall experience. 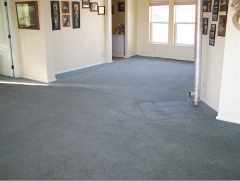 I will definitely recommend Georgia Carpet Industries to others and would be glad to act as a reference for you. It is not often one can transact business so well and effortless across the total continent like we did! Bob and Dee Dee B.
I just would like to say thank for making doing business with Georgia Carpet a pleasure. You provided me with the product I needed and quoted me a price that you stuck with. We will definitely be doing business together in the future. Thank you so much for your kind and patient attention to my order for carpeting for our family's porch. The screened porch on our home overlooks a yard full of trees which is serene and beautiful. It is my favorite place in the world. On the Memorial Day weekend, my husband and our son cut the rug to fit and laid it on the porch. The whole job took only 30 minutes. It looks just perfect and we are so pleased. Please thank all your workers for their time and skill. It was a pleasure doing business with you. We received the carpet shipment yesterday. I really appreciate all your help - you were great to work with and I really appreciate you expediting everything. We are still in awe that we purchased Tavern Grade (real) hardwood for the camp and still can not believe we did not have one (1) split, crack, or damaged piece of wood. 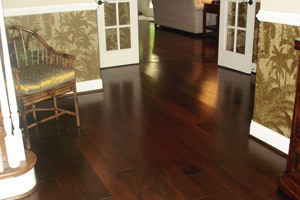 Everyone who has seen it can not believe it is not first quality flooring, you could have fooled everyone. Some of the pieces we put down were comparable to what we call the finest gun stock wood, and we certainly are proud. April 2, 2009 Dear Mr. Porter: I would like you to know what a devoted employee you have in Mr. Tim Dean! I was on the internet shopping for carpet. Totally inexperienced! Mr. Tim answered all of my questions, he gave me many hints, all price quotes, lots of knowledge. Although I had many questions on several occasions' he was never to busy to answer my needs to my questions. I was able to find an installer locally. My carpet, Mohawk® Palmetto Best arrived in excellent condition on the day promised. Mr. Tim was also able to send my installer samples which he had requested. I will recommend Mr. Tim to all my friends & family members. Thank you Mr. Tim for all your wisdom & knowledge! You deserve a big pay raise! Sincerely, Mrs. S. Mc E.
I want to thank you all for your fine service. You were very responsive to our every need and what impressed me the most was that after the sale, you responded to our every request and truly devoted your time and effort to "get everything right". I would not hesitate to recommend you to my friends and I have already done so. In these difficult economic times it is a pleasure to do business with true professionals. Thank you and continued success! Buster, Rec’d the 2400 square feet of Bruce flooring for the new house. The floor installers finished the job yesterday. The job looks awesome and thanks for providing exactly what you promised! We were concerned after the local vendor claimed that you would substitute something of lesser quality than the item we specified. Happy to say that everyone is extremely impressed. 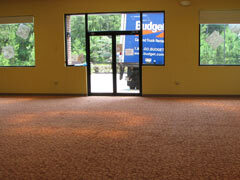 JUST A QUICK NOTE TO LET YOU KNOW HOW PLEASED WE ARE WITH THE NEW CARPET AND VINYL THAT WE PURCHASED FROM YOU. JUAN AND HIS TEAM DID A SUPER JOB WITH THE INSTALLATION. THE HOUSE LOOKS BEAUTIFUL. THANK YOU PAUL AND PAM V.
Hi Donna, My apologies for getting back with you a few days later. I was wanting to wait and see some of the results as the carpet installer progressed. 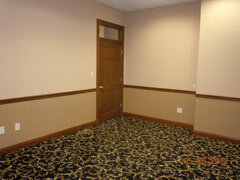 The carpet looks wonderful; and the installer mentioned how nice the pad was. My family is quite pleased and excited to have a carpeted basement now! Thank you for all your patience. I knew this process would be timely, and then add in unexpected weather-related issues. I could have very easily said, forget it all; we'll just order locally and be done with it all. But in all honesty, we needed to be true to our budget, and Donna, you were so kind and calm I felt quite at ease working with you. Georgia Carpet Industries is quite fortunate to have you on their team! 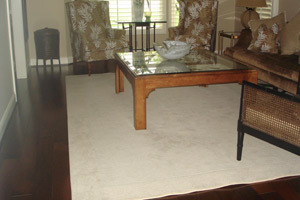 Wanted to thank you again for the great service and quick delivery of my carpet. It was installed Wednesday and looks great and now I can put up the Christmas tree. Regards and Happy Holidays, Chuck and Terri C.
Thank you so much Lynn for the tracking number and for the outstanding service! You and your organization couldn't have been any more fantastic to work with!!! I will be sure to use you again and refer you to everyone I know!!! Please forward this email along to your manager/owner to express my appreciation for your outstanding service!!! Thanks for the great service. You truly made this a very enjoyable buying experience. I will refer you to others for consideration and will not hesitate to buy through you again. The carpet is installed and looks awesome. From: Tammy Sent: Sunday, January 22, 2006 To: Linda Subject: Great Carpet! Thank you so much for all of your help with my carpet. I am so happy with my choice. 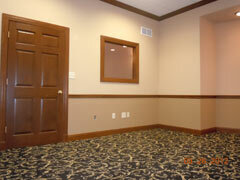 I cannot believe the quality of the carpet, and the amount that I saved working with you and your company. 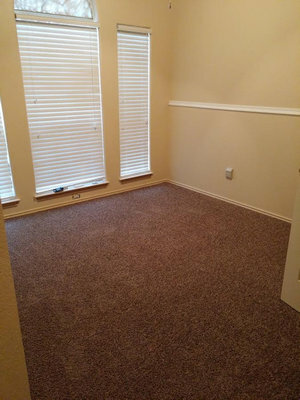 I was skeptical to be spending so much money over the internet on carpet that I had never seen before, let alone not even knowing if the amount I ordered would be enough, but with your help everything turned out better then I could have hoped for! I have already recommended your company to several people. I am now looking for area rugs and runners and will not hesitate to order from you! From: Quay & Teresa C. Sent: Thursday, June 02, 2005 To: kim miller Subject:Thanks!! Hi Kim, I've just scanned your website and found your picture - the last one! (I'm attaching our pictures) I sent your name and website address to our cousins in San Antonio. If she can convince her husband to replace their carpet with this laminate, she'll probably be contacting you. Thanks again for being so helpful with finding our choice in laminate flooring. Can't wait to put it down!